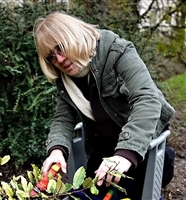 Scissors can be used for a range of uses in the home including crafts, food preparation and gardening. You may have several scissors depending on the activities you use them for. Intricate work like embroidery will require scissors with fine sharp blades, using the wrong type will make the job much harder. In comparison, scissors required to cut wall paper or dressmaking material tend to have much larger handles and blades. Scissors may be used to open food packaging, if you find it difficult to open cartons or plastic film packaging e.g. on cheese. (Consumer Affairs Directorate Department of Trade and Industry, 2000). 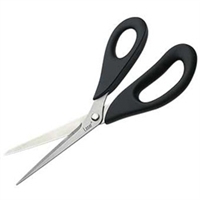 Ensure the size of the scissors suits your hand size particularly if you are looking at large or small scissors. If they are not a suitable size they may be uncomfortable or impossible to use. Most scissors are designed for right handed use but left handed scissors are available. A few models can be used with either hand but scissors made for a specific hand use will always be easier to use and last longer. (Peta, 2006). If you experience hand tremor in your right hand or if you have the use of only your right hand consider using left handed scissors. (National Tremor Foundation, 2010). Small scissors cut more precisely than larger ones and individuals with low vision may find them safer than using knives for some tasks. Fine scissors with sharp blades tend to be used for fine work, like embroidery. The length of the blades and whether they are rounded or pointed will effect the tasks they are used for. Rounded blades tend to be used for cutting paper and for use with children. Pointed blades tend to be sharper. Scissors for cutting food should only be used for food and never left wet. Some are dishwasher safe, if not they can be washed with soapy water and dried immediately. Safety catches or a blade guard for use when carrying or in storage. Check these are not too fiddly to use. Ensure they do not open too wide so they do not cause pain to your hand. (DLF, 1996). Easy-grip scissors may have spring loaded handles and may be lighter than standard scissors. They can be operated with either light finger and palm pressure or by using thumb and fingers. They may be useful for people with reduced grip, swollen or painful joints. Table top scissors (pictured) have a small plastic stand (with a slip resistant base), to use them you just push down, depressing the handle. This can be useful particularly if you have tremor or difficulty with fine movements. Many table top scissors can be changed from handheld to table top use as the scissors slide in / out of the base. Large and/or soft touch handled scissors may facilitate grip and may be useful for people with sensitive skin or fingers or tremor and generally tend to be more comfortable to use. Roller cutters and electric scissors are useful for cutting a range of materials, some of which may be used with a cutting board. Some of these roller cutters are designed primarily for craft materials such as paper or leather, others are suitable for cutting fabric or layers of materials such as are used in quilting. Ensure you are able to manage the switches, make sure they are not too fiddly to use. If you have tremor or the use of only one hand your posture may affect your ability to use scissors safely. Sitting down, using a table with your feet flat on the ground and your arms supported may make it easier to use scissors. (Peta, 2006). Scissor skills are generally developed in childhood over a period of time by starting initially with simple exercises and then moving to more intricate projects. (Peta, 2006). This may be a useful approach if you have the use of one hand only or more strength on one side and are becoming accustomed to using, for example left hand scissors for the first time.